The Hoʻoulumāhiehie version of the Hiʻiaka story, the ancient saga of the goddess Pele and her younger sister Hiʻiakaikapoliopele containing nearly 300 chants, was published as a series in the Hawaiian language newspaper Ka Naʻi Aupuni in 1905–06. Now University of Hawaiʻi at Mānoa Professor Puakea Nogelmeier has reproduced the text in modern Hawaiian orthography. He also created an English translation that strives to preserve both the literal translation and the pacing, humor and drama of the original. Illustrated and designed in large-folio format, limited centennial editions of Ka Moʻolelo o Hiʻiakaikapoliopele, are being offered by Awaiaulu Press. Using data from telescopes atop Hawaiʻi’s Mauna Kea and images from the Hubble Space Telescope, University of Hawaiʻi astronomers have suggested what makes quasars glow. UH Mānoa graduate student Hai Fu and Astronomer Alan Stockton studied the collision of a gas-rich galaxy with a giant galaxy, such as that pictured in the computer simulation by Joshua Barnes, UH Institute for Astronomy, top. They found evidence that the glow results as the gas-rich galaxy feeds the black hole at the center of the giant galaxy. 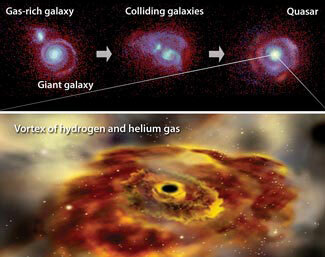 The bottom image is an artist’s conception of the gas vortex at the heart of a quasar by A. Simonnet of Sonoma State University. The quasar fndings were published in the Aug. 1, 2007 issue of Astrophysical Journal Letters. Read the abstract. Using data from tide gauges and deep-ocean pressure sensors, a team headed by University of Hawaiʻi at Mānoa Professor of Ocean and Resources Engineering Kwok Fai Cheung has developed a computer algorithm that calculates post-earthquake tsunami potential anywhere in the Pacific basin. He validated the model with tsunami data from five earthquakes near Alaska, Japan and Chile since 1964. The mathematical model has been incorporated into tsunami forecasting tools used by the National Oceanic and Atmospheric Administration and is being adapted by the Chilean Navy and the National Marine Environmental Forecasting Center of China for tsunami forecasting. An international team studying three-dimensional seismic images of a megasplay thrust system at the Nankai Trough south of central Honshu, Japan report that slip on the fault could have generated the devastating tsunami that struck Japan in 1944. Megasplay faults rise from the subduction boundary (where one tectonic plate slides beneath another) upward to the seafloor. Progressive steepening of the fault at Nankai increases the potential for vertical uplift of the seafloor when slip occurs, notes University of Hawaiʻi at Mānoa Professor of Geology and Geophysics Gregory Moore and his colleagues in the Nov. 16, 2007 issue of Science. The megasplay geometry explains why subduction earthquakes on such faults often generate tsunami. Moore is continuing his investigation of the splay fault system as part of the international Integrated Ocean Drilling Program, which is using the Japanese drill ship Chikyu to gather samples and place sensors. 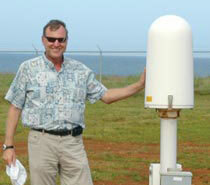 University of Hawaiʻi at Mānoa Professor of Meteorology Steve Businger, pictured, and recent graduate Kirt Squires are using satellite, aircraft-based instrument and long-range lightning sensor data from hurricanes Katrina and Rita to better understand the inner workings of the storm systems. Their analysis is slated for publication in the American Meteorological Society’s Monthly Weather Review in January 2008. The intensity of lightning outbreaks near a hurricane’s epicenter relates to the heat energy released in the storm’s eyewall, where the most intense rain and powerful winds occur, but these interactions occur thousands of miles out to sea. The new PacNet sensor network’s ability to pick up lightning’s electromagnetic signal over water from a great distance could hold the key to improved hurricane forecasting, the researchers say. Increased heating from the sun likely triggered the end to the last southern hemisphere ice age. Fossils from sediment and ice cores indicate that the Southern Ocean warmed well before the atmospheric carbon dioxide levels rose, the University of Hawaiʻi at Mānoa’s Axel Timmermann and mainland colleagues report in the Oct. 19, 2007 issue of Science. Cyclical variation in Earth’s orbit exposed Antarctica to increased sunlight and heat. Ice reflects sunlight, but as the sun melted Antarctic ice, the dark ocean absorbed even more heat and began to release CO2. The climate change scenario was previously indicated by Timmermann’s computer modeling at the International Pacific Research Center. A University of Hawaiʻi at Mānoa astrobiology researcher suggests that Mars’ shifting axis accounts for the extent and shifting location of frozen subsurface water on the red planet. In addition to dust-covered remnants of Martian glaciation, water vapor diffused into the soil, forming ice in the pores as changes in the planet’s tilt created variations in temperature and humidity level, the Institute for Astronomy’s Norbert Schörghofer proposes in the Sept. 13, 2007 issue of Nature. Earth doesn’t experience a Mars-like wobble thanks to the stabilizing effect of the Moon’s orbit. Read the Nature editor’ summary. Here’s another reason to cope with stress: older men who used coping strategies, such as taking steps to solve their problems, had higher levels of high-density lipoproteins—the "good" cholesterol—than men who react with negative behavior, self-blame or social isolation. That’s the conclusion of a study reported by University of Hawaiʻi at Mānoa Associate Professor of Family and Consumer Science Loriena Yancura and colleagues at the American Psychological Association’s 2007 convention in San Francisco. The study involved 716 men evenly split between blue- and white-collar occupations who are part of the Normative Aging Study. Average age was 65. Magnetic resonance imaging is a highly useful diagnostic tool with a major practical drawback: patients must remain largely motionless for 5–10 minutes it takes to achieve high quality scans. That’s a difficult task for many, including children and individuals suffering from mental illness. University of Hawaiʻi at Mānoa Professor of Medicine Thomas Ernst is working with collaborators at other institutions to develop an adaptive system that uses a camera-based tracking system to compensate for patient motion, ensuring high quality MRI scans even in uncooperative patients. Elderly veterans using Veterans Affairs primary care services report higher rates of combat exposure than their younger or middle-aged counterparts. Yet they exhibit the lowest rates of post-traumatic stress disorder and other psychiatric disorders. Among clinic users interviewed in a study by University of Hawaiʻi at Hilo Professor of Psychology B. Christopher Frueh and mainland colleagues, those over 65 had significantly better scores on mental health than 18–44 or 45–64 year olds. Previous studies of populations exposed to natural disasters or terrorist attacks also suggest that age may provide protection against PTSD and depression, the authors note in the August 2007 issue of the American Journal of Geriatric Psychiatry. Longitudinal studies following a cohort over time are needed to rule out factors such as earlier mortality among those with psychiatric problems, increased healthcare options or reluctance to admit psychiatric symptoms among older veterans and different stressors or reduced support for younger veterans. Exposure to light may affect the development of mammalian zygotes and early embryos, a new study by Institute for Biogenesis Research Emeritus Professor Ryuzo Yanagimachi and Japanese colleagues suggests. The scientists exposed mouse and hamster zygotes to cool white and warm white fluorescent lights. Zygotes exposed to the cool light typically used in laboratories produced more reactive oxygen species, small highly reactive molecules that can damage cell structures, and resulting embryos were less likely to develop to full term when transferred to surrogate mothers. The control group, shielded from light, was most successful. Embryonic sensitivity to light varies by species, and working in a dark room with dim light may not be practical, the researchers note in the Aug. 20, 2007 Proceedings of the National Academy of Sciences. Still, efforts to optimize the success of in vitro fertilization procedures by simulating the in vivo environment as closely as possible should take light into consideration, using warm white fluorescent lighting and limiting exposure. An average of two or more alcoholic drinks per day doubles the risk of cancer of the endometrium, the tissue lining the uterus, according to data from nearly 42,000 women from Hawaiʻi and Los Angeles enrolled in the Multiethnic Cohort Study. Alcohol consumption in any amount was previously associated with increased risk of breast cancer, notes Laurence Kolonel of the University of Hawaiʻi at Mānoa’s Cancer Research Center of Hawaiʻi, principal investigator for the cohort study. More about the Multiethnic Cohort Study of Diet and Cancer at the National Cancer Institute website. In a John A. Burns School of Medicine study, kava consumption was associated with increased level of one liver enzyme associated with toxicity, according to a study reported in the June 2007 issue of Clinical Toxicology. Other enzymes associated with liver toxicity were unaffected, however, and the results do not signify liver damage, says Associate University of Hawaiʻi at Mānoa Professor of Complementary and Alternative Medicine Amy Brown, calling for additional research.